Santa Cruz, typically known as a haven from the heat, was far from that on Friday. 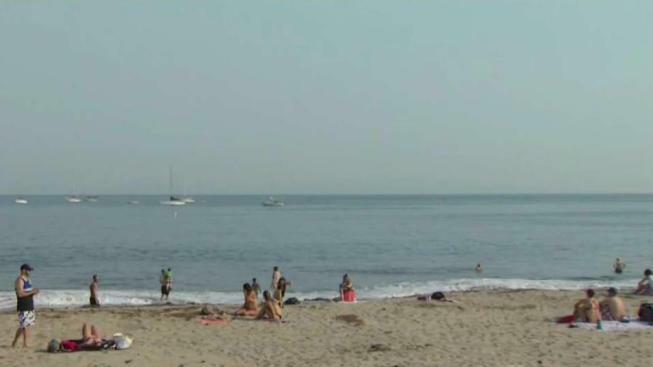 Temperatures peaked at or around 100 degrees across the beach town, which is expected to be filled with scores of people during the hot holiday weekend. Santa Cruz Boardwalk spokesperson Mark Lipton said the Labor Day holiday is one of the busiest weekends at the boardwalk each year, and even larger crowds are expected this year as Bay Area residents flock to the Pacific Ocean seeking relief from the heat. "The beach is the place to be," Lipton said. Beachgoers are reminded to hit the road early or risk being trapped in gridlock along Highway 17. "If you're not on 17 by 9 o'clock, forget it," Mikel Sessions, an employee in Los Gatos, said. "It's going to be a parking lot." Those looking to cut around highway traffic in Los Gatos will continue to run into a roadblock this weekend. During summer weekends, the southbound Highway 17 on-ramp at Santa Cruz Avenue has been closed to keep the city free of those people trying to find a shortcut using city streets. This weekend marks the last weekend this summer that the on-ramp will be closed.